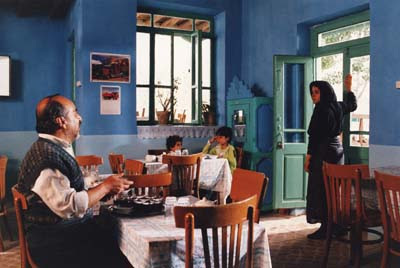 The Iranian film, Café Transit (also known as Border Café, 2005) describes the struggles of a recently widowed mother of two small children in her efforts to live on her own in a traditional male-dominated society. 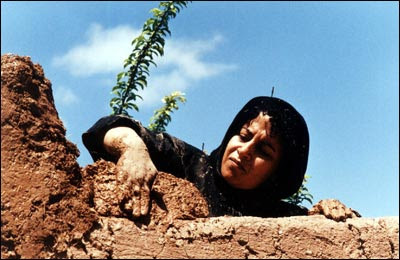 The write and director of the film, Kambuzia Partovi, had earlier written the screenplay for Jafar Panahi’s superb The Circle (Dayereh, 2000), which also covered the theme of women who cannot find a place for themselves within Iranian society. The collaborative association with Panahi continues with this film, because Panahi was the film editor for Café Transit. The story begins with the young widow, Reyhan, attending to the shutting down of her deceased husband’s roadside “truck stop” café, which is located in western Iran near the Turkish border. According to traditional customs of the local society, she is now expected to marry and move in with her already-married brother-in-law, Nasser, but this is something she doesn’t want to do. Her own background (she comes from another region) does not follow this custom, and, besides, she doesn’t feel any love for Nasser. She prefers to remain an unmarried widow and carry on operating the café on her own. Nasser, however, sees it as his duty to look after his bereft sister-in-law. Gradually it becomes evident, though, that the issue for him is only secondarily a matter a compassion and more a matter of personal honor: he is concerned about losing face in the eyes of the other villagers. Reyhan is polite and respectful at all times, but she is also determined. She decides to retain the services of her husband’s café assistant, Oujan, and redecorates the place to make it more attractive. The Farsi title of the film is Ghahveh Khaneh, which in English means simply “coffee house”, but here it refers to a kind of café that usually serves relatively simple food to an almost exclusively male patronage. The clientele for such cafés in this area are mostly truckers, many of them European, who are making the long run across Iran and Turkey to deliver goods to and from Europe. Many of these men live away from home for years doing this job, and when they learn that there is now a roadside café with the food and flavour of a “woman’s touch”, they soon flock to be her customers. Such a booming success comes as a further shock to the humiliated Nasser, who operates his own roadside café that is now losing customer’s to that of his sister-in-law. Nasser increases the pressure on Reyhan to give in to his face-preserving demands, and he eventually turns to the local authorities in an effort to have her place shut down. Throughout all the pressure placed on her, Reyhan remains polite and respectful, but quietly resistant to his demands. Mindful of social restrictions about unaccompanied women appearing before men in public, she remains in the kitchen cooking, hidden from the view of the appreciative drivers who are not even aware that a woman is cooking their meals. Two additional characters appear as the story proceeds, and they contribute to an external perspective on the events. One is a Greek truck driver, Zakario, who accidentally discovers that the cook of his tasty café meals is a woman, and he gradually becomes romantically attracted to her (despite very few face-to-face meetings). The other outsider is a homeless teenage Russian girl, Svieta, who has fled a war-torn area and is now hitching rides with drivers in hopes of reaching safety in a Western European country. After the penniless Svieta is dumped by a driver at Reyhan’s café, Reyhan offers her shelter and food, and then even employment as an assistant at the café. Towards the end of the story, Nasser manages to get the authorities to shut down Reyhan’s café and force her in to his own home. But this is not the real end. At the close of the film, Reyhan leaves Nasser’s home, acquires another café directly across the road from Nasser’s café, and opens up for business. The woman has not been beaten. Although most of the actors and actresses are not professionals and have been drawn from the local area, the two major characters are played by top Iranian performers. Nasser is played sympathetically by Parviz Parastui, one of the most distinguished Iranian actors. Reyhan is played by Fereshteh Sadre Orafaiy, who is the wife of director-writer Ka mbuzia Partovi. Her previous appearances in Jafar Panahi’s The White Balloon (Badkonake Sefid, 1995) and The Circle (Dayereh, 2000) had already displayed her considerable talents of projecting an inner tension. In all these films, she acts in a restrained and respectful manner, never displaying the pyrotechnical emotions that one might feel is justified on the basis of the depicted circumstances. And yet her expressive, compassionate face and gaze suggest her true feelings, and this has a powerful emotional effect. The cinematography in Café Transit is generally effective in what must have been low-budget filming circumstances. On the other hand the narrative scheme of suggestively encapsulating the entire story as a set of flashbacks doesn’t work so well. The film actually begins with separate shots of Zachario and Svieta in the “present” recounting their memories of their time with Reyhan. For both of them, Reyhan had an evidently seminal effect on their lives and how they should live. Yet the significance and depth of their later interactions with Reyhan is not brought out effectively in the ensuing scenes. And the focalization does not come exclusively from Zachario and Svieta: there are many scenes which could not have been witnessed by those two. Overall, the viewer’s main focus of attention and interest is on the fate of Reyhan, herself. It is possible that the always unpredictable Iranian censorship authorities (who, according to Partovi, excised several scenes from the film) played some havoc with the storytelling. We should be thankful, I suppose, that the censorship authorities allowed the film to be released at all. (More surprisingly, Café Transit turned out to be Iran’s official entry for the US Academy Awards.) Iranian filmmakers generally have to walk a delicate line when discussing the condition of women in their society. They are forbidden from explicitly criticizing the system, but they still often manage to get their points across implicitly. For example, in The Circle, which was banned in Iran, the women in focus are actually criminalized and excluded from society by an essentially corrupt social system. Café Transit, on the other hand, is more mild – the principal character, Reyhan, is severely constrained by society, but is not cast out of it, and she is presented as a favorable moral model in comparison to the “immoral” vagabond, Svieta. But the Partovi story has its underlying theme, just the same. It would have been easy to present Nasser as an evil, corrupt character who was abusing Reyhan. But this is not what has been done. Nasser is presented as an ordinary, essentially moral, man who is trying to live by the codes of society. In the hearts of everyone of us there lies the bestial and the angelic. Social values are supposed to summon up the angelic within us. But here we see the ordinary man, Nasser, encouraged by social rules to follow in the footsteps of his thuggish brother, Karim. Just as in The Circle, the people executing society’s moral code are not depicted as inherently evil – they are not essentially corrupt. What is corrupt is any system that evokes the most bestial instincts of man to (a) reduce women to servitude, (b) harm the innocent, and (c) crush dissent and close off the free exchange of ideas. Very well written review, thank you! Enjoyed your take on the film.